To do what we do, photographing wild animals. It’s essential to have at least a working understanding of the animal you’re trying to photograph. You adapt your field craft skills, to hopefully, outwit your subject. That is why we spend so much time reading about and observing animals in the wild. 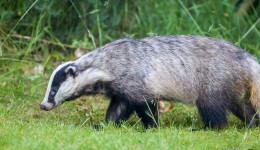 One of the animals we observe the most are Badgers. Their first visits coincided with us putting up bird feeders. When holes started appearing in our lawn, we were able to work out we had Badgers in the area. It also became apparent that it was the newly put up bird feeders that were attracting the Badgers. Food dropped by the birds made a welcome snack for a hungry Badger. To stop our lawn coming under attack, we began sprinkling a few peanuts every night. In return for our peanut bribe, we got a hole-free lawn and can watch Badgers from the comfort of our sofa. We now know we have a set very near our home, and so over the last couple of years, we have been visited by many a hungry Badger. Usually, visits are not long after sunset, so at times we get to take pictures of Badgers. However, we do spend a great deal of time just sitting, and watching the nightly steady stream of visitors keeping us entertained. Over the years we have become quite adept at being able identifying individuals. When an individual comes onto the lawn, we almost always know who it is. It becomes easy to believe that you know something about the habits and life they lead. 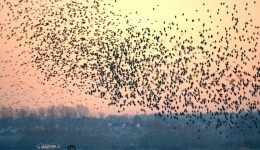 Then every once in a while, something happens that gives you a glimpse, into the realities of their life. About four weeks ago two Badgers we call Padwan, (P) and Badgey Badge, (BB) were in the garden for their nightly peanut snack. A sight we had witnessed many times over the course of the last year or so. Then the visits stopped. Five days later BB finally returned to our garden. BB is a male Badger and has been visiting us for about 18 months. This night he was in a very sorry state. Left ear covered in blood and not very well attached and his left front leg curled up underneath him. As soon as he moved, it was apparent that he couldn’t put any weight on his damaged leg. He was just about managing to walk, using his three good legs. All sorts of emotions triggered that night. These are wild animals, but we spend much more time with them in the course of a year than we do with family and friends. Strange as it may sound, they are part of our life. What could we do? 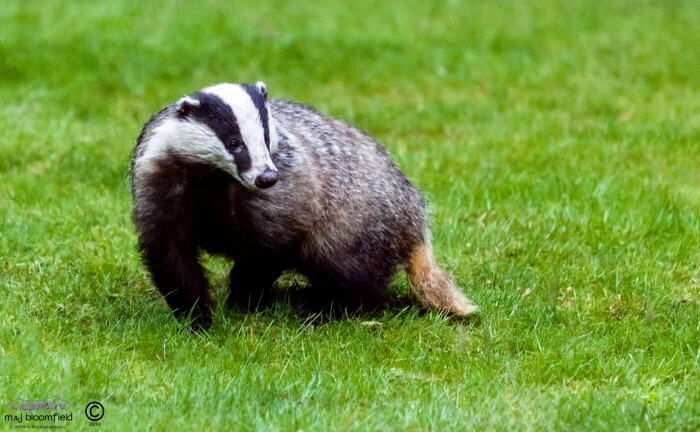 A Badger on three legs is at a tremendous disadvantage. On a good night, they roam far and wide to find enough to eat. A Badger with only three good legs is not going to be able to travel far to find enough food. Would he be able to find enough food at all? To make matters worse, Badgers put on extra weight in the autumn, to see them through the hardships of winter. We had long discussions about what we should do. Could we get BB to a vet? Unfortunately, it sounds like a great idea, in the heat of emotion. However, it is far from practical. First, you have to catch your Badger and to trap any wild animal is very traumatic for them. Take BB away from his clan even for a short while, and he may never be accepted back. But standing by and watching an old friend, starve slowly to death was going to be very difficult. So we came up with a plan. Give BB a lot more food to see him through and hopefully; his leg would get better. It seemed like such a simple plan. However, we don’t know when the Badgers will visit, or who will come in or in what order. We had only ever put out small amounts of food. We didn’t want them to become reliant on humans. Typically we put out just enough to supplement their regular diet. This situation was going to need a lot more food and a plan. Operation “Feed BB” swung into action. We’ve had successes, and we have had some spectacular failures. The worse night was when the same Badger, the wrong one, got three lots of food and BB got nothing. However, over the weeks we have had more successes than failures. And with skills worthy of Special Forces, over the weeks we have managed to get BB more food. Has it helped? Well, we think it has. Over the past four weeks, BB has been getting better. The last two visits have seen improvements each time. As of last night, he is now using the leg again, putting his full weight on it. He still has a little bit of a limp but not that noticeable. His ear is healing up, and he now has a jaunty angle to his left ear. As the leg has improved, he has gained more and more weight. He is just starting to get a very healthy plump look. Thank goodness he is now a lot better. Now it’s time for us to start cutting back on the amount of food to make him less reliant on our handouts. It looks like BB with be all right and have a good chance of surviving the winter to come. As for P, we don’t know what happened to her. We haven’t seen her since that night although she had been a regular for over a year. We’ve checked the local roads just in case, but no sign. With a bit of luck, P will turn up again. However, as time passes, it seems more and more unlikely. We sometimes think back to that summer night when she first appeared. A young cub accompanied by BB, on one of her first outings learning the ropes. The chances are we will never know her fate, but rejoice in being a tiny part even if for a short period, of her wild life.